The Syracuse Center for Peace and Social Justice is located at 2013 East Genesee Street. The mission of the Center is to promote collaboration among groups working for progressive social change. 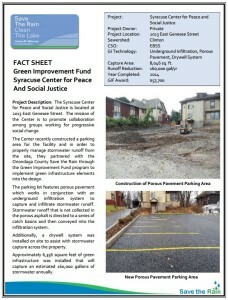 The Center recently constructed a parking area for the facility and in order to properly manage stormwater runoff from the site, they partnered with the Onondaga County Save the Rain through the Green Improvement Fund program to implement green infrastructure elements into the design. 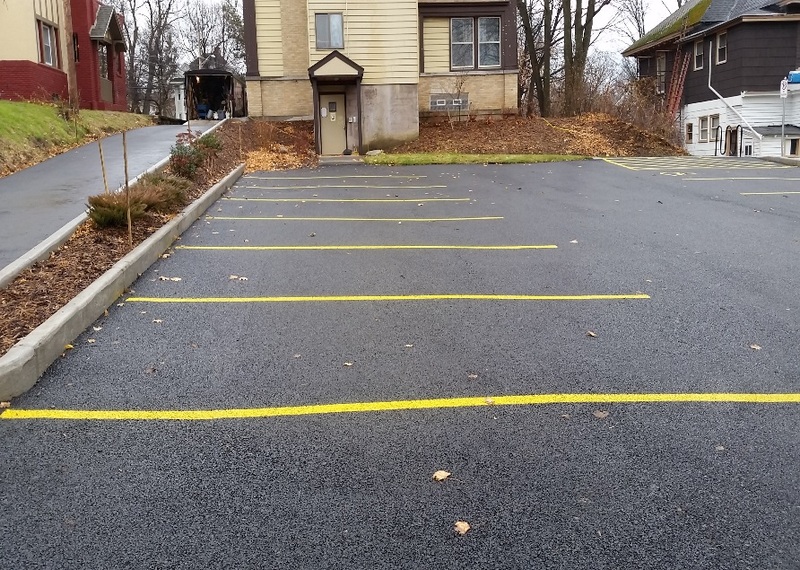 The parking lot features porous pavement which works in conjunction with an underground infiltration system to capture and infiltrate stormwater runoff. Stormwater runoff that is not collected in the porous asphalt is directed to a series of catch basins and then conveyed into the infiltration system. Additionally, a drywell system was installed on site to assist with stormwater capture across the property. Approximately 6,356 square feet of green infrastructure was installed that will capture an estimated 160,000 gallons of stormwater annually.